The Prince of Wales and Duchess of Cornwall have thanked the community in the Wiltshire town of Wootton Bassett for their support for the armed forces. They were among thousands of people who paid their respects as a funeral cortege passed through the town for two UK soldiers killed in Afghanistan. 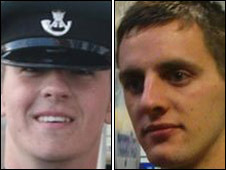 L/Cpl Daniel Cooper, 21, of Hereford, and Rifleman Peter Aldridge, 19, from Folkestone, died in Helmand province. Charles said their loss was "agonising and devastating" for their families. Mourners threw bouquets of flowers and crying could be heard from the crowd as the hearses drove past. The men's bodies were flown back to RAF Lyneham in Wiltshire earlier. Their deaths bring the number of British soldiers killed in Afghanistan to 251. Wootton Bassett's mayor, councillor Steve Bucknell, said: "Yes there is sorrow, but there is also a great deal of pride as well. As often is the case in Wootton Bassett, pride and sorrow are mixed so closely together." He welcomed the royal visit and said: "I am sure I speak on behalf of the vast majority of people in the town when I say it is an honour to have the royals in town. The war memorial in Wootton Bassett, like others around the country, lists the names of those killed in the First and Second World Wars. This market town is now interwoven with the UK's modern day conflicts and the Prince of Wales wanted to praise the people at the heart of this community, so there was a visit to the Cross Keys pub in the centre of the High Street. The Cross Keys has offered hospitality to the families who have come to the town from around the country for their loved ones' final journeys home. Later, at a reception at the Conservative Club, the prince told local people they were special and he wanted to thank them on behalf of the entire nation. "I think it is testament to how important the armed forces are to the Royal Family and what the people of Wootton Bassett have been doing here." L/Cpl Cooper, of 3rd Battalion The Rifles, was killed on 24 January as he tried to clear a path south of the Sangin district in northern Helmand. His death came two days after Rifleman Peter Aldridge, of A Company 4 Rifles, was killed. He died on 22 January while on foot patrol with 3 Rifles Battle Group, also near Sangin. Rifleman Aldridge's parents, from Kent, spoke of their pride for their son - who was on his first tour of duty - saying he "died a hero". "He believed in the Army and was proud of his job and we are so proud of you Peter," they said in a statement. L/Cpl Cooper went to Whitecross High School before joining the Army and deploying to Afghanistan in October last year. Lt Col Nick Kitson described the 21-year-old as "the consummate soldier, the complete package; fit, bright and dedicated to his work". The soldier's parents, Karl and Caroline Cooper, said he was a "caring son, brother and partner" who would be "sadly missed". They added: "Daniel, we were proud to be your parents from the day you were born." 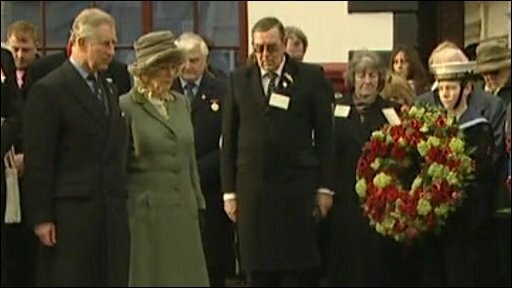 The Prince and Duchess each laid wreaths at Wootton Bassett's war memorial, and Charles later spoke to guests at the town's Conservative Club. "My wife and I have come here today really to express our sincere and heartfelt gratitude to the people of Wootton Bassett for their unstinting support of Britain's armed forces," he said. "As a father myself I can only begin to imagine how agonising and devastating it must be for the families of Daniel and Peter and indeed the families of all those who have lost their loved ones on operations overseas. "Above all this country owes these brave men a great debt of gratitude which is why it's wonderful to see the good people of Wootton Bassett honouring that debt time after time when our boys come home on their final journey." He added: "Your actions have come to symbolise our nation's grief. We would like to express our profound gratitude to you all for your support."